Plasma could not be created in the ITER vacuum vessel without switching network units, whose operation creates the voltage that "ionizes*" the cloud of fuel atoms in the vacuum chamber. This key system is under development at the Efremov Institute in Saint Petersburg, Russia, where tests recently concluded on a prototype unit. 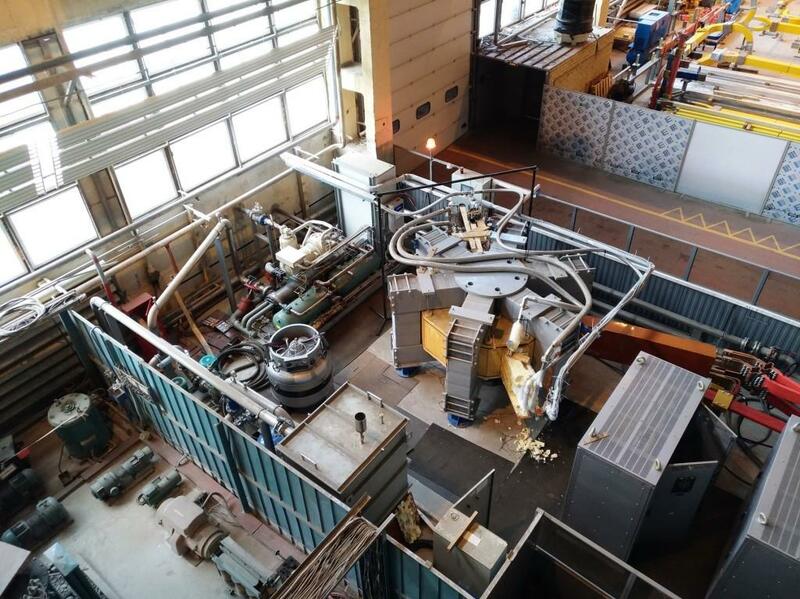 These circuit breakers performed to ITER Organization specifications during recent tests at the Efremov Institute in Saint Petersburg. At the start of a plasma pulse, electrical current will flow into the ITER magnet coils until they are "loaded" to the nominal operation values of each system. To start a current in the plasma, the circuit breakers of the switching network system (present in the circuits of the central solenoid and the top and bottom poloidal field coils, PF1 and PF6) will be opened to divert the current into large resistor banks. This forced passage through the resistors creates a voltage that is transferred to the coils and to the vacuum chamber, initiating gas breakdown* and initial plasma current ramp-up. The highly complex switching network system is made up of mechanical switches designed for continuous current up to 45 kA, thyristor circuit breakers, and a two-stage counterpulse circuit that provides arc-free current transfer from the mechanical device to the resistor. "The switching networks are a fundamental system for the ITER coil power supplies because of their role in starting the plasma current," explains electromechanical engineer Francesco Milani, who is the ITER technical responsible officer for the switching network, fast discharge unit, DC busbar and instrumentation procurement package. "Without switching networks there could be no current interruption and therefore no voltage for the plasma initiation." 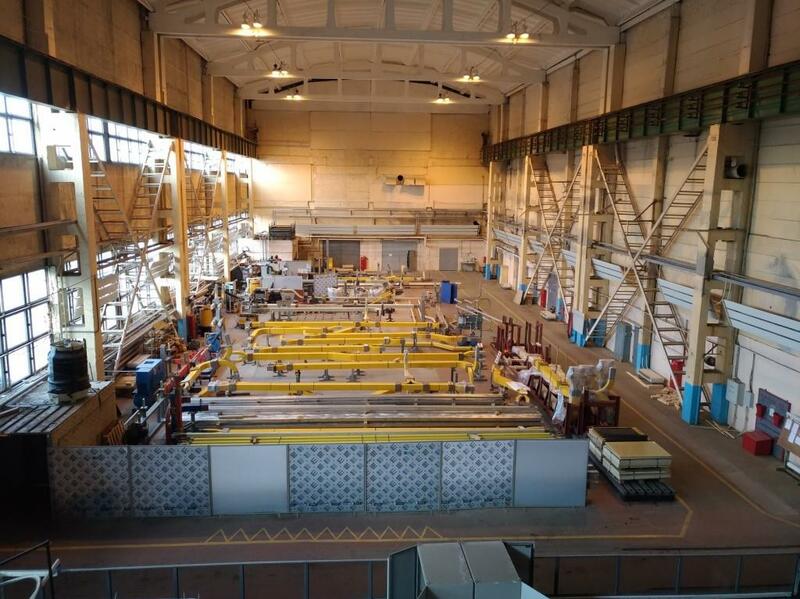 From 2 to 6 April, tests were carried out on a prototype switching network unit at the Efremov Institute of Saint Petersburg, contractor to the Russian Domestic Agency for all of the electrotechnical equipment under its procurement scope. The results obtained during current commutation tests at rated current, most importantly, demonstrated full compliance with the ITER Organization technical requirements. Milani, who witnessed the tests for the ITER Organization, confirmed that the test program has been completed satisfactorily. "The team at the Efremov Institute has been demonstrating excellent technical expertise for many years, throughout the development and design of this important coil power supply procurement package. These latest results are an important milestone for the Russian Domestic Agency and its procurement activities for ITER." The fabrication and supply of switching equipment, busbars and energy absorbing resistors for power supply and protection of the superconducting magnetic system of the ITER reactor is the most expensive and one of the most complicated of the 25 systems falling within the scope of Russia's responsibility. According the current schedule, procurement of the system's components must be completed by 2023. *Gas breakdown = the ionization of the injected fuelling gases, when the voltage applied across the gas separates electrons from atoms creating a "soup" of charged particles called a plasma. The objects of the tests—the mechanical switches that open the circuit—are partially hidden near the centre of this photo of the test apparatus. The make switches seen in red and white were successfully tested during an earlier test campaign. To one side is a small magnet (inductive storage) with its nitrogen cooling system. 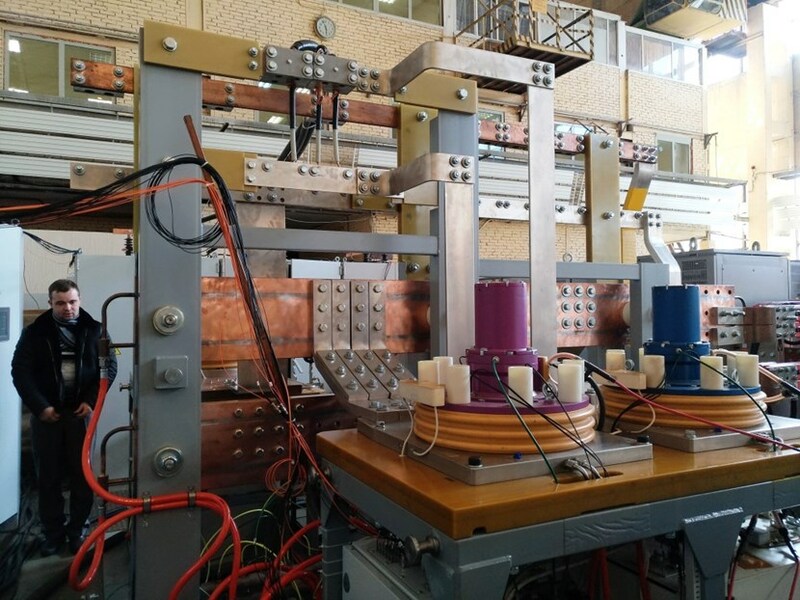 The Efremov test rig for ITER switching equipment reproduces the source of the current (magnet power supplies), the transport system (busbars) and the final client (the magnet system). 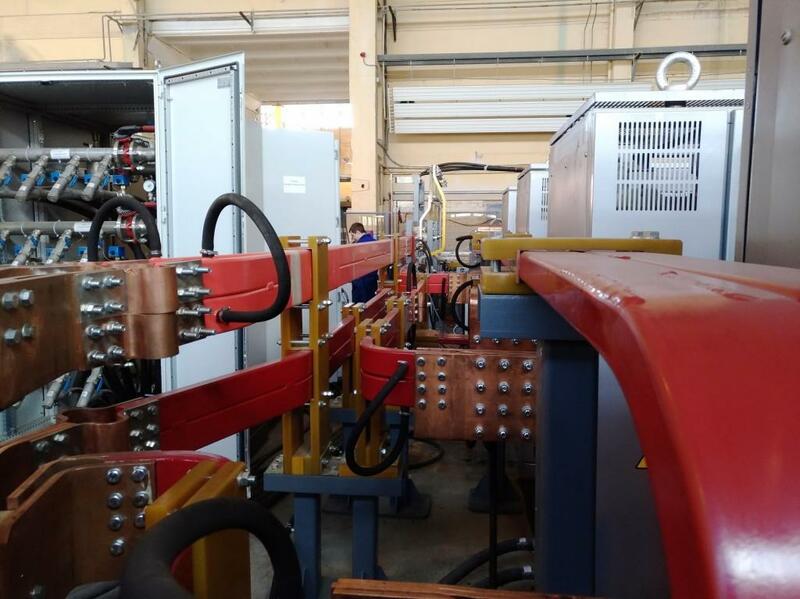 In another area of the Efremov, the ITER busbars are in series production. More than 5 kilometres (500 tonnes) of material is needed to connect the ITER coils to their power supplies. Busbars are comparable to electrical cables, only massive and more rigid. 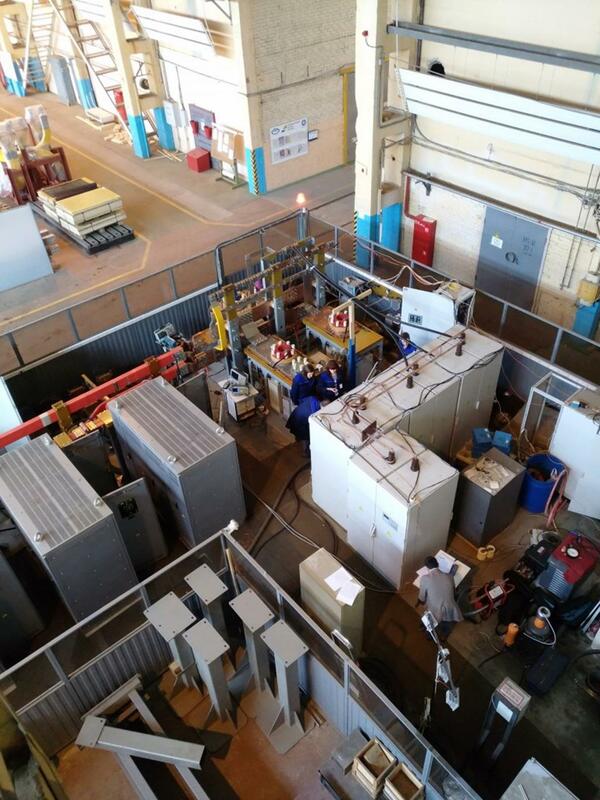 These test rig busbars connect the switching equipment to the magnet.